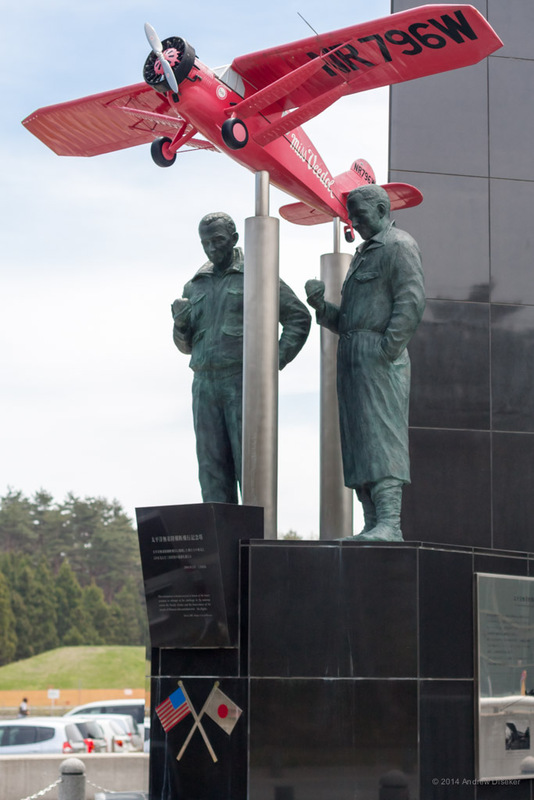 Pangborn and Herndon, unsung heroes of aviation history, along with “Miss Veedol!” This monument is right at the entrance to the grounds of the Misawa Aeronautics and Science Museum, in Misawa, Japan. 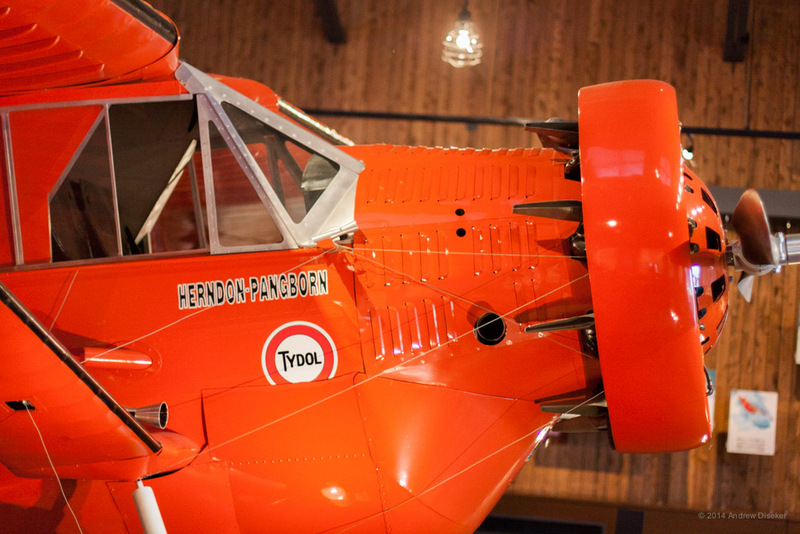 A plaque describing the flight of Pangborn and Herndon in the “Miss Veedol” in 1931. In 1927 Charles Lindbergh set out from New Jersey, in order to prove it was possible to fly non-stop across the Atlantic Ocean, which hadn’t been done before. His success stirred the imagination of imitators around the world, and in 1931 two men decided to try to fly non-stop across the Pacific Ocean, a feat that would cover almost twice the distance and take 41 hours! Originally intending to fly around the world for a world record, they had to abandon their attempt in Russia, near northern Japan. 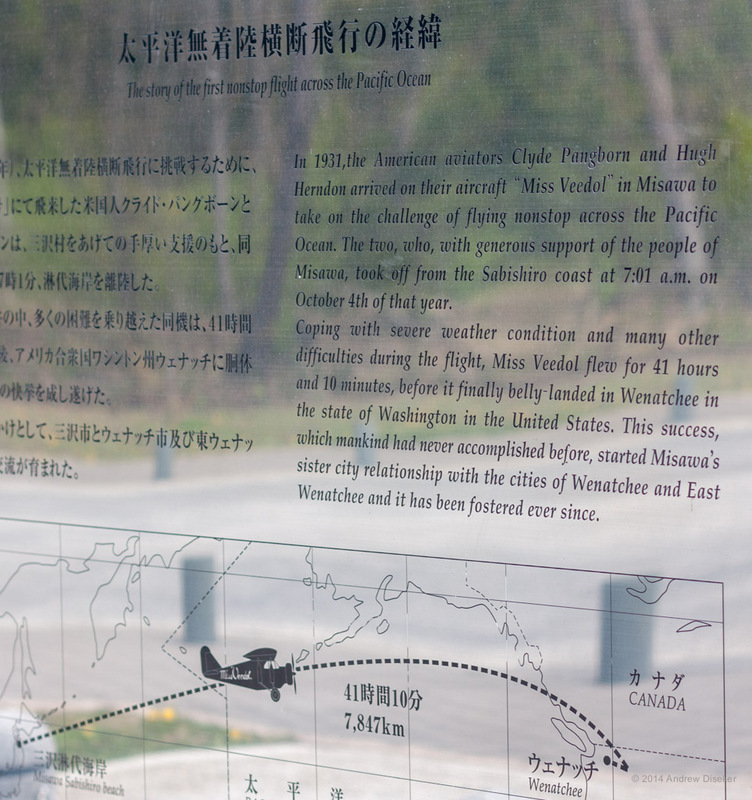 Instead, they decided to try to fly non-stop across the Pacific (the $25,000 prize the Asahi Shimbun newspaper offered for the feat wouldn’t have hurt!) Modifying their Bellanca J-300 airplane to hold almost twice the normal amount of fuel, they barely took off from Sabishiro Beach in Misawa, northern Japan, dropping their landing gear along the flight to save weight. Pangborn even left his boots in Japan, just to shave off a few pounds! The two men apparently didn’t get along on their flight, which is kind of understandable when you see how small the plane was, while holding two pilots alternating flying, sitting alongside fuel containers for nearly two days straight! After many harrowing moments in the flight (at one point Pangborn had to climb out to manually detach a couple of supports from the landing gear they had dropped!) they finally arrived in the skies over Washington State. They thought about flying on to Boise Idaho to add more distance to their record, but weather prevented them, and they tried several other airports in Washington State with no success. Finally they had to land, and they picked a field in Wenatchee, Washington, where they made a belly-landing damaging the propeller. 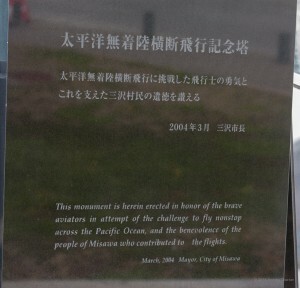 They succeeded, and both the towns of Misawa and Wenatchee honor their flight, Misawa with a giant Aeronautics and Science Museum (where I took the pictures here), and Wenatchee with a National Historical site, as well as a full-sized, flying re-creation of the original “Miss Veedol”. 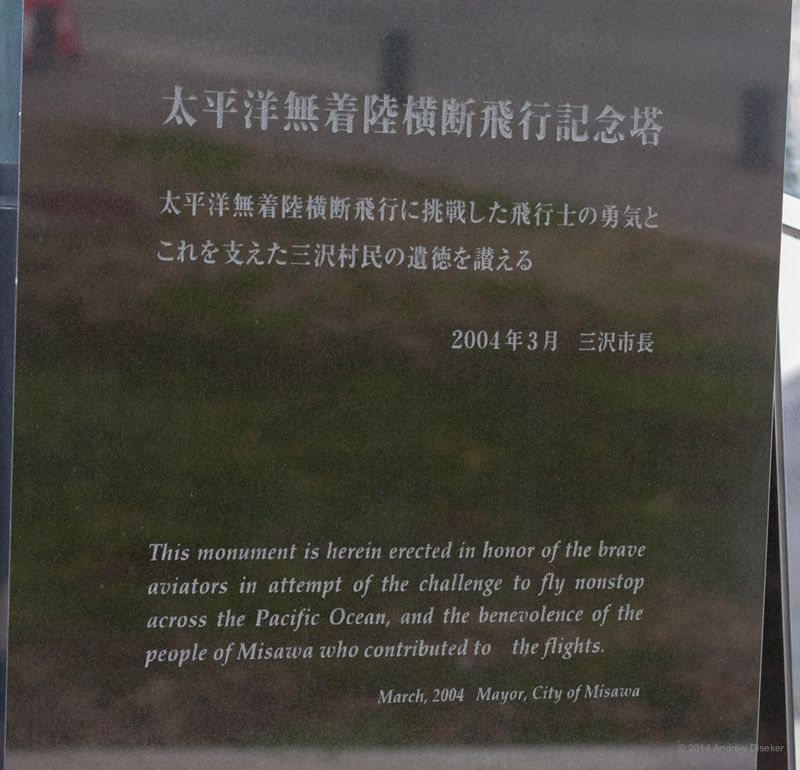 The two towns consider themselves “Sister Cities”, and the aviation club that built the new “Miss Veedol” actually flew it over in Japan, where it was on display in the museum in Misawa. I hope this wasn’t too boring a story, but I wanted to help spread the word about the courage and strength of will that these two unsung heroes showed in their historic feat of aviation! Tagged aviation, Herndon, Japan, Misawa, Miss Veedol, non-stop flight, Pangborn, record. Bookmark the permalink. Thanks, Amy! 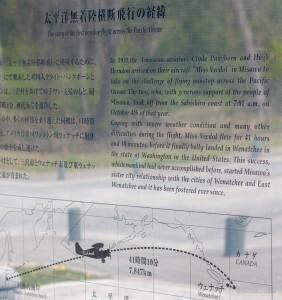 It was really neat to see all the exhibits at the museum in Misawa, and one of these days I’d like to make a trip to Wenatchee, just to make that connection between towns! What those two men did was amazing, in that little plane. Kind of sad that the original was lost, but at least the memories will last!